It can be easier said that done to think of rewards that your target audience will want. I have noticed that some campaigns omit even the most obvious of crowdfunding rewards that would be appreciated and pledged for by potential backers. Some platforms permit you to add new rewards during the campaign, others do not. During my own campaign, I realised that I should add an additional reward aimed at businesses and it did work to encourage more high-value pledges which helped to secure my total. My most popular pledge was for a copy of the book valued at €15 but I needed people to pledge for the more high-value rewards to reach my target. The value of rewards you offer will depend on the size of your target. If it is only €500, you know that rewards of €10-€50 will get you there relatively quickly. However, if you are looking for $100,000, you’re either going to have to be very very popular or devise rewards that include a number of high value $1000-$5000 rewards. Research suggests that rewards in the 40-50 (whichever currency) are the most popular but it is advised to have a selection of low and high value rewards too. The trick is thinking of rewards that your target audience will want, that they are prepared to pay for and that they will attach a value to. Ideally those rewards should not cost you that amount in money or time if you wish to have sufficient time to devote to completing your actual project. You should also ensure that costs such as postage are incorporated into the reward cost. The most obvious reward is a copy or a ticket of whatever you are doing. For example, if you are producing a self published book, then a number of the rewards should be devoted to the book. I offered a copy of the book for €15 (Ireland and UK) and €25 (Rest of World). I also devised one for €45 for two books to be sent anywhere in the world and an acknowledgement on the book and website. Inadvertedly, I underestimated the cost of postage in Ireland and UK so backers from the UK received my book for its cost price. It didn’t matter in one way as they were pre-sales but yet, if they had purchased it post-launch, it would have cost them €20. However, I recently went to fund a project for a play. As it was about a topic I had studied during my MA, I was keen to see it and would have pledged up to €80 for two tickets. However, I couldn’t believe that tickets were not on offer as a reward. Perhaps there was a valid reason for this and it wasn’t possible for them to offer them but it seemed a shame. In the end, I only pledged €15 – for a chance to win 2 tickets as I wasn’t particularly interested in any of the other rewards. While some people may give money regardless of the reward, most people like to receive something they see as value in return for their money. The Irish Seed Savers recently ran a campaign and as it is a great concept, I was excited about pledging approx €25 in return for a couple of packets of seeds – seeds that I would plant in my raised bed and feel that I was part of the Seed Savers continuing. There were no seeds on offer in the rewards. There were offers of traditional music CDs, certificates, thank yous, but no seeds. Maybe there was a reason that they couldn’t send seeds abroad but then I would recommend they use the Irish Fundit site and appeal to Irish backers. I felt a bit guilty but I wanted something relevant to the campaign for my €25 – even one packet of seeds would have sufficed. I found another ‘seed saver’ campaign which was successful. It was looking for less money than the one mentioned above and to be honest, there wasn’t much difference in what they received and the number of pledgers but it succeeded. Why? I would imagine it was because the rewards were relevant – people were pledging to save heritage varieties of seeds and they received seeds in return. 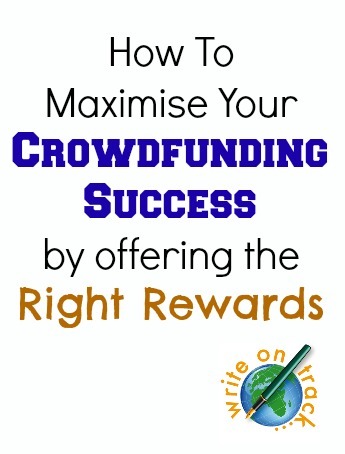 One of the advantages of having rewards that people want is that your campaign becomes a ‘popular’ one and will probably be featured on the crowdfunding platform’s home page – thereby giving it more coverage and driving more people to view it. Remember that some people enjoy the buzz of finding a concept to support, they like being part of the journey, they see pledging as helping something come alive and buying themself a gift that will arrive in a few months – therefore they want to see rewards they want. I would also warn against having rewards that would consume significant time and money to create. While offering a private concert to backers may sound like a wonderful idea, if enough backers pledge for that reward, you may end up exceeding your goal but spending all your time travelling and delivering that reward. This is why it is important to calculate how much you need and limit the number of backers that can pledge for the various rewards – do not overstretch yourself. Do have a look at successful campaigns that are similar in theme to yours. Work out what were the popular rewards? You might feel that you should come up with something completely original and that is fine for one of the rewards but go for the ‘safe and popular’ choice with most of them. You also need to ensure that the rewards are spread from very low amounts to high amounts of $1000. It is possible to have two different rewards for the same amount too, for example, two choices of rewards for $50. 1. 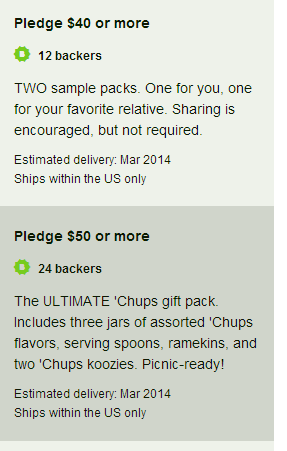 Your Product with a Lifestyle Suggestion – Chups are offering jars of their creation along with small surprises in some rewards. I like the way their language suggests picnics and sharing – they aren’t just selling varieties of ketchup, they are providing an experience. 2. Keep It Simple – just offer the game or book that you are creating. This highly successful campaign (at 500% of its goal with 12 days to go at the time of writing this post) is offering virtually the same reward for each pledge amount but the shipping outside of the US in incorporated into the higher rewards. 3. A Special Experience – this band is offering copies of their album, t-shirts, your name on the credits etc for most of their rewards. However, for a whopping €2,000, not only will the include all from the lower priced rewards, the band will cook the backer and his/her friends a meal and play them a 40 minute concert. At €2,000, this is unlikely to be very popular but with a goal of €10,000, just one backer for it would make all the difference. I think they are right to price it so high – make it extra special, something that money almost cannot buy unless it was in a crowdfunding campaign. 4. One of your Creations with a Difference – we are used to see books, cds, dvds, performance tickets on offer as rewards. In this campaign, a milliner is looking for funds for a trade show. Her most expensive reward include a luxury bespoke hat plus you can choose the name of her next collection. While I may not go for the top reward, knowing you are helping someone on their business journey and getting a bespoke hat designed by a new, up and coming, designer, would encourage some to pledge for the second highest reward. 5. Share Your Knowledge – Can you offer to teach your skills to interested participants by offering a tutorial via skype or by offering workshops to a school? This music business was looking for funds to build their website and some of their higher value rewards include offering workshops to schools or art centres. 6. 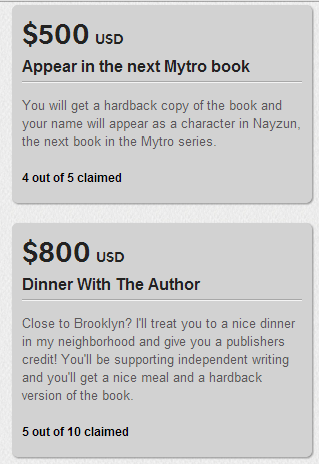 A Personal Experience – You can’t get much more personal than offering having dinner with a backer or making them a character in your next book. John Biggs is writing a trilogy and four backers wish to be named as characters in his next book and 5 will travel to his neighbourhood for dinner. While his ebook and hardback copies of the book were popular too, these particular rewards are seen as having special value. I hope this post has helped you to plan the ideal crowdfunding rewards for your campaign, rewards that will be popular and ensure your campaign is a success. If you would like more help planning your campaign, consider taking our 2 week online course on our sister site We Teach Social where we help you prepare each aspect of your future campaign.